Nathan Stevens has contributed to PopMatters and Spectrum Culture. He and I are both avowed fans of the Vince Guaraldi Trio’s A Charlie Brown Christmas. He celebrated Christmas growing up; I didn’t. But it turns out A Charlie Brown Christmas speaks to us in similar ways, and that just speaks to the magic of this great album. Here are our respective reviews, which I’ve included as the second installment in my ongoing Faves series. Music is attached to a majority of my childhood memories. Singing in church choirs on Christmas eve, listening to James Taylor as my Dad baked cookies, my Mom and I singing along to Purple Rain on car trips. But A Charlie Brown Christmas doesn’t have any specific memory, time, taste, or place to it. It’s always been there, no specifics required. I grew up in a vaguely Christian household. My Mom considers herself non-religious, my Dad is a recovering Baptist, but I don’t recall listening to a ton of secular Christmas music growing up. I blame my dad being a church choir director on that. The Unitarian Universalist church I went to as a kid had as many Jews and atheists as it did practicing Christians but all of us uniformly could agree that A Charlie Brown Christmas was tradition. Even when my parents split when I was five, my stepfamilies had the same tradition. From Montana to Alabama to my current home in Oregon, A Charlie Brown Christmas is carried. My interactions with Vince Guaraldi’s music were largely passive for most of my life. It was only in retrospect that I realized this was the first jazz album I ever listened to and perhaps the first album I truly loved. My later enjoyment of Dave Brubeck and Miles Davis could be traced to here and, perhaps in a stranger view, all the way to my introduction to hip-hop, by way of the ever-jazz-biting A Tribe Called Quest. Essentially, A Charlie Brown Christmas was a foundation-setter for my later musical explorations. But, perhaps more importantly, was the emotional impact of this album. Sure, “Linus and Lucy,” “Skating” and “Christmas is Coming” are all sheer, unbridled joy, but the entire album has a deep, tangible sense of melancholy. The two versions of “Christmas Time is Here,” placed back to back, are tear-stained snow. But it’s not the heartbreaking “Another Lonely Christmas” or any Hallmark movie equivalents on pop radio, singing about dead folks and car crashes during the holidays. The lyrics are, in fact, quite happy! But Guaraldi’s playing, along with the slightly out-of-tune children’s choir, gives it all a polish of tranquil sadness. There’s nothing direct about it, nor, indeed, terrible. Just a gentle reminder that in the Northern Hemisphere it’s the coldest time of year and it’s perfectly normal to feel a bit of sadness even with presents gleaming under the tree. That’s a surprisingly mature and exceptionally important lesson for a kid to have. And I don’t think I ever truly understood it until a few years ago. But that’s the magic of it. It’s been here for my entire life and I’m still finding new things in that wondrous jazz world. It’s been woven into the fabric of my life. I can’t imagine a Christmas without it. I never celebrated Christmas. I mostly remember it through window displays, acres of distant lights, parties seen through windows, gatherings with obscure great-aunts and cousins from the non-Jewish side of my family, drives through the rich part of town to see what garish light shows they’d cooked up this year. I saw Christmas through a glass. It was incomprehensible to me. 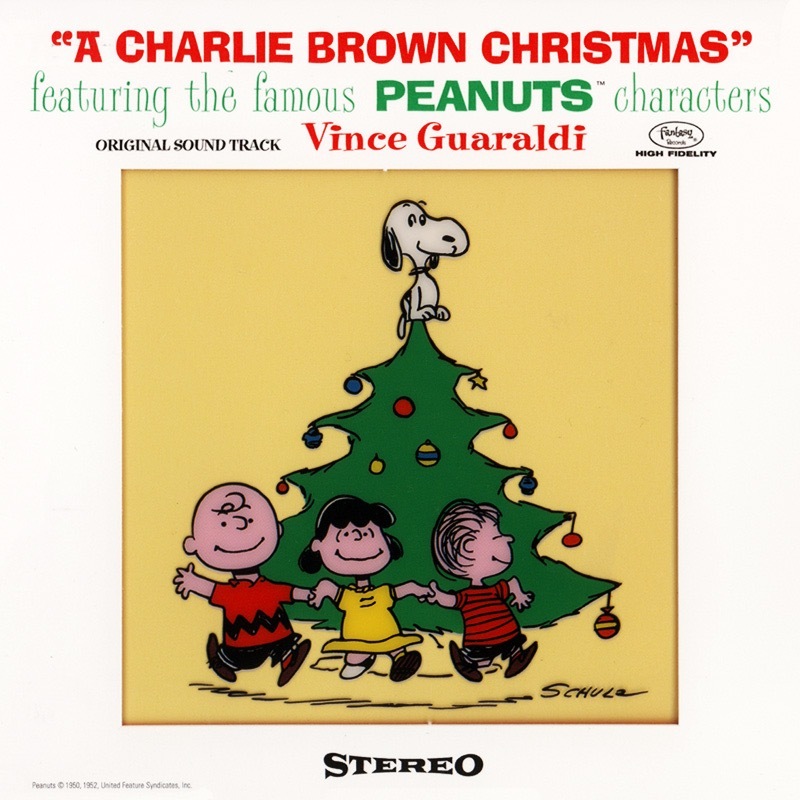 Maybe this mystery is why the Vince Guaraldi Trio’s A Charlie Brown Christmas speaks to me so much. Most Christmas music is all cheer; if you’re not in on the “Christmas spirit,” whether because you don’t celebrate it or because you’re sick of hearing “Jingle Bell Rock” coming out of every storefront, you won’t buy it. With Charlie Brown, we get the cheer secondhand. The songs are happy enough, but… why is it so slow and quiet? What’s with those weary little pauses? Where are the sleigh bells? This is not difficult jazz. The chords are simple, the progressions pop, the variations on the melodies conservative. It’s nowhere near the level of abstraction as, say, Coltrane’s “My Favorite Things.” But the recognizability of these songs edges Charlie Brown into uncanny-valley territory. We expect Coltrane to morph “My Favorite Things” into something far beyond a Christmas song. Here, we’re familiar enough with what we’re hearing to recognize it and know something’s off. I think the key to Charlie Brown is that it evokes Christmas Past rather than Christmas Present. These are songs kids sing, translated into the traditionally adult art form of jazz. Most kids at the age when Christmas is truly exciting don’t listen to jazz. Charlie Brown combines something we know as adults with something we remember from being kids, filtered through an almost ghostly melancholy. This might make Charlie Brown‘s appeal seem hyper-specific. But I think its reach is so broad (is any other Christmas album taken so seriously?) because most of us see Christmas through a glass. Adults who celebrate it remember the joy of experiencing it in childhood and are a bit more cynical now. Those who don’t celebrate it – like me – know how it feels to see it all around and gaze at its lights, separated from it by a cultural chasm. Kids will probably like this album too, but they’ll just groove to the music and not get wrapped up in the underlying emotions. Charlie Brown is, of course, a soundtrack. It plays like one at times, though it’s arguably a more substantial work of art than the Peanuts Christmas special it accompanies. No one needs to hear “Fur Elise” ever again in their lives, and a choral arrangement of “Hark The Herald Angels Sing” is disarmingly straightforward. The Christmas-carol covers are the meat of the album. It does, however, contain one of the best Christmas songs I’ve ever heard. “Christmas Time Is Here” is presented in two versions. The first is a six-minute instrumental. In the special, the instrumental is a constant, underscoring the scenes that don’t need to be emphasized by a more recognizable theme. Similarly, it adds padding here to an album that might otherwise be over too quick. But the vocal version is the true treasure. The children’s choir barely sounds human. Mixed deep behind the instrumental track, slightly out of tune, they sound like ghosts – perhaps those of our childhood Christmas memories, however they may manifest.